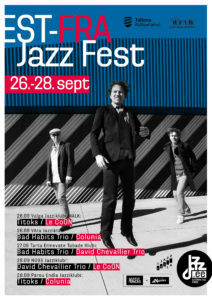 In September, the Estonian Jazz Union introduces EST-FRA Jazz Fest, a festival where Estonian and French jazz meet to build a bridge between two cultures. The festival takes place on September 26-28 in Estonian cities and celebrates the beginning of a new collaboration with Nantes Jazz Action. Concerts will be held in Tallinn, Tartu, Pärnu, Valga, and Võru. 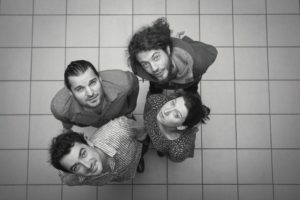 The French ensembles will be joined on stage by the acclaimed Bad Habits Trio and talented young gypsy-jazz trio Titoks from Estonia. The first volume of EST-FRA Jazz Fest took place in March 2018 in the city of Nantes, France, where alongside local French artists performed Kadri Voorand Trio, Peedu Kass Momentum and Jaak Sooäär & Aleksei Kruglov 4tet. On September 26-28, the follow-up festival will be held in Estonia: three ensembles from Nantes will be warmly welcomed to Estonia to perform and give workshops in various cities.